Joseph, B.; Ocampo-Martinez, C.A. ; Cembrano, M.
A simplified sewer nework modelling approach based on the hybrid linear systems framework is discussed. It involives both continuous and discrete variables to include a novel approximation of the overflow and flow over weirs phenomena. The model is validated against data provided by a simulator based on a physical model and is shown to be easily adapted to an optimal/predictive control setting that allows the computation of optimal control actions through the solution of a mixed-integer programming problem. Joseph, B.; Ocampo-Martinez, C.A. 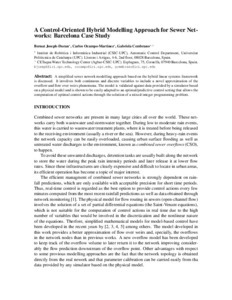 ; Cembrano, M. A control-oriented hybrid modelling approach for sewer networks: Barcelona case study. A: IWA Conference on Instrumentation, Control and Automation. "Proceedings of the 1th IWA Conference on Instrumentation, Control and Automation,". Narbonne: 2013, p. 1-4.